Although Randy Johnson rookie cards were printed during an era of extreme market saturation, many of them have held up well in value over time. His towering 6'10" frame allowed him to throw his blazing fastball and devastating slider at truly unique angles. That unique combination of physical skill led to an exciting Hall of Fame pitching career that you just don't see very often. His dominance on the mound made him one of the most exciting and popular players of his day. And in this guide, we'll discuss everything you need to know about collecting each of his many different rookie cards. Classic produced sports cards from the late 80's to the early 90's and usually their designs are instantly recognizable due to their rather plain look and feel. In 1989, the company released this 200-card set in three series. Johnson's card was part of the "light blue" first series that was packaged as part of a baseball trivia game. The large two-tone pink and blue borders of this card are fairly ugly, making this one of Johnson's less-appealing rookie cards. You'll notice that the image of Johnson on his Donruss rookie is the same that appeared on his Classic issue that we previously reviewed. I always thought it was kind of a funny picture of Johnson--he just looks confused as if he was caught off guard for this photo. Ever since this set was released, it has been one of my favorites of any that was produced in the 1980's. The purple and black borders on this card give it a truly unique touch. While not nearly as valuable as the 1989 Donruss Ken Griffey Jr. rookie, Johnson's rookie still holds respectable value in top grade. 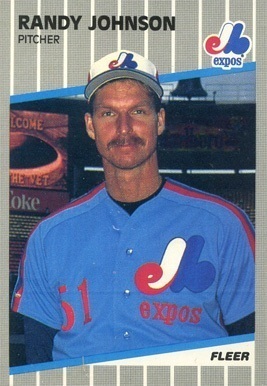 This 336-card set was sold as a factory set so some don't consider this to be a true Randy Johnson rookie card. Regardless, I think it's still worth mentioning on this list. The set itself wasn't really all that different from the regular Donruss release in terms of design outside of the green and yellow borders. In top grade, these can be worth $20 or so. Need a reminder of why the baseball card bubble burst in the late 80s and early 90s? It was because of companies like Donruss releasing so many different sets like these and flooding the market. Yet another factory set, this one included only 56 cards and featured a "The Rookies" logo in the upper right corner. I do give this card credit from a design standpoint as it does feature a nice action shot of Johnson. This card is Johnson's most controversial rookie card you'll find. The most notorious and valuable is the one with the Marlboro cigarettes ad in the background over his left shoulder. Production of these were stopped and later print runs will show the ad either partially or completely blocked. If you find one with the ad showing in top condition, it can be worth around a few hundred bucks. 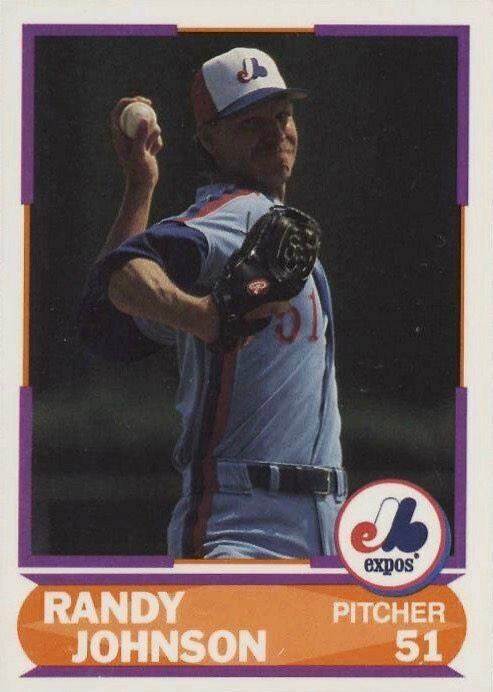 Johnson was traded from the Expos to the Mariners during the 1989 season so he was included in Fleer's 132-card "Update" set that year. The design is exactly the same as the regular Fleer issue except the numbering system on the backs of the cards utilized a "U" prefix. There was no Marlboro ad controversy with this card so you'll only find it in one form. Released for the Canadian market, Johnson's 1989 O-Pee-Chee rookie card looks nearly identical to its Topps counterpart except for the "O-Pee-Chee" distinction in the upper right. The card shows Johnson on a bright sunny day looking off into the distance in his red, white and blue Montreal Expos uniform. Because of the lower print run and quality of these cards, they can be more difficult to find in high grade than their Topps counterparts. Hence, the large pricing premium placed on them. Panini released these 1 7/8" x 2 11/16" stickers as part of a 480-card set. The eye appeal of Johnson's card is great as he is shown with a nice smile on his face, enclosed by a strong red border. As they were stickers, many kids removed them to place in albums or on various other surfaces. That said, finding them still intact and in top grade can be somewhat difficult. Like Donruss, Score released several sets in 1989 that featured Johnson. His regular Score issue features a great image of Johnson ready to hurl a fastball wearing that awesome aqua-colored uniform of the day. 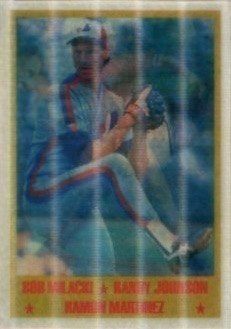 A large, yellow banner in the upper portion of the card clearly denotes Johnson as a "1989 Rookie". You can pretty much instantly recognize a Score design when you see it and this is no exception. I always liked those baseball field symbols along the bottom that featured the player's team and position. This 100-card set was Score's way of calling out some of the brightest young stars of the day. Alongside Johnson, other notable players in this set were Craig Biggio, Edgar Martinez, Roberto Alomar, Gary Sheffield, and one of the most-hyped youngsters that year: Gregg Jefferies. Score used another great action shot of Johnson on this card. Those blue borders look great but they can make it difficult to find this card in top grade given their susceptibility to showing wear. Like Fleer's "Update" set, Score issued this 110-card factory set through hobby dealers that featured many rookies and players who had been traded to other teams. Because he was traded to the Mariners during the season, he was included in this small set. The cards have the same basic design as the regular Score issue that year. I've always liked this card for one simple reason: it gives you a great idea of how intimidating it would be to be an opposing hitter facing off against Johnson. The purple and orange color scheme seems a bit of an odd choice but I think it still works. But, that image of Johnson ready to fire one across the plate really makes it stand out from some of his other cards. In the late 80's, I remember several different card designs that utilized these images that shifted when you moved the angle of the card. There were 225 cards in this set but some cards, like Johnson's, actually featured multiple players. Depending on the angle at which you view this card, you'll either see Randy Johnson, Ramon Martinez, or Bob Milacki. Obviously, the other two pitchers didn't quite have careers like Johnson but this was still an interesting concept of including multiple players in one card. The "Tiffany" version of Johnson's 1989 Topps card is his most valuable rookie card that you'll find. It might be surprising that a card from a period of massive print runs could still be worth so much. These premium Tiffany cards were produced in limited numbers as part of factory sets so there just aren't as many of them around compared to the base sets. The Tiffany versions can be distinguished because of their glossy fronts and higher print quality. 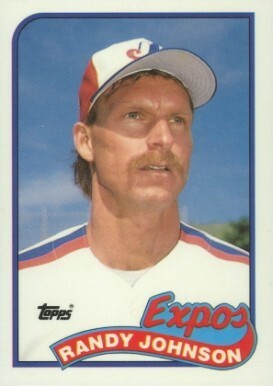 Johnson's career got off to a very slow start and during the 1989 season the Expos traded the future Hall of Famer to the Seattle Mariners. In 1974, Topps released its first "Traded" sets which featured rookies called up from the minors and players who changed teams during the season. Several other manufacturers, as you've seen with other cards on this list, followed suit with this concept years later. The Traded version of Johnson's rookie card isn't worth quite as much as his regular Topps card but in Tiffany form it's still quite expensive in top grade. In 1989, Topps released these over-sized 2 1/2" x 3 3/4" cards that featured dual-imagery and horizontal layouts reminiscent of their sets from 1955 and 1956. I remember buying a few packs of these as a kid and Tom Glavine was the biggest name I got. Because of their larger size, many of these were likely stored loosely as they didn't quite fit in the traditional sleeves and holders. That's why finding them in top condition can be tough, hence the large price tag in a PSA 10 holder. 1989 Upper Deck was a landmark set in the hobby due to the terrific images and premium quality design of the cards. In fact, Ken Griffey Jr.'s rookie card from this set is one of the most iconic of all baseball cards. Johnson's rookie may not be nearly as valuable but it still holds decent value in top grade. I've always liked Johnson's smile/smirk in this image. Printed by Topps and issued by Woolworth retail stores, this set featured 33 high-gloss cards and was loaded with stars of the day like Don Mattingly, Jose Canseco, and Wade Boggs. It looks like Topps used a different pose of Johnson that they snapped the same day they were taking shots for his regular Topps card that year. These are much harder to find in top grade than his regular Topps cards and will set you back around $60 in PSA 10 form. Randy Johnson was an incredible force on the mound and truck fear into hitters throughout his career. After 22 seasons in the Majors with various teams, Johnson would post a career .329 ERA, with 303 wins and an incredible 4,875 strikeouts. Johnson was easily inducted into Cooperstown in 2015. Johnson was one of the most dominant pitchers to ever play the game and his incredible popularity will keep his rookie cards in demand for years to come.